14.06.2010 - Five new experienced players to fulfil the new ambitious objectives. 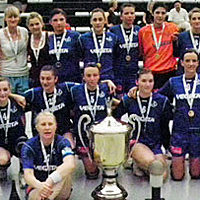 11.06.2010 - After winning both Croatian titles, the Koprivnica team prepare for next season. 10.06.2010 - Marta Bon gets one of the most wanted left backs on the market. 09.06.2010 - The Montenegrin team take advantage of the home court. AUT Hypo Niederösterreich CRO HC Podravka Vegeta DEN Aalborg DH DEN FCK Handbold A/C DEN Viborg HK ESP Balonmano Parc Sagunt ESP S.D. Itxako FRA Metz Handball GER HC Leipzig GRE AC Ormi-Loux Patras HUN FTC RightPhone HUN Györi AUDI ETO KC ITA HC Sassari MNE Buducnost T-Mobile NED T+A/VOC Amsterdam NOR Byasen HE NOR Larvik HK POL SPR Lublin SSA POR Madeira Andebol SAD ROU C.S. Oltchim Rm. Valcea ROU C.S. Rulmentul-Urban Brasov RUS HC Dinamo RUS Zvezda Zvenigorod SLO RK Krim Mercator SLO RK Olimpija SRB ORK Vrnjacka Banja SUI LC Brühl Handball SVK SKP Bratislava TUR Maliye Milli Piyango SK UKR HC "Smart"